It has been 10 months since the 139-page Wells Report and the accompanying 82-page Exponent Report were issued. Within a week, we created this website and posted an initial, detailed critique of the analysis and conclusions of those reports. Since then, independent critiques of the Wells and Exponent Reports have multiplied and scientists across the country who examined the PSI and weather data have concluded that science fully explains the PSI measurements found in the Wells Report. We have posted a collection of those positions on this website and they remain available for review here. Many thoughtful people have, with further information and consideration, revised their initial impressions, which were largely based on false information leaked by League personnel and on the interpretations put on ambiguous, at best, facts by the League and its lawyers. The League, however, in pursuing its legal strategies, has escalated its defense of the Wells Report and its conclusions, often at the expense of accuracy. In addition, to preserve the public impressions of the Wells Report and the League’s pursuit of Tom Brady, the League rejected the suggestion of measuring PSI during every game in the 2015 season and publishing the results. Instead, it chose to perform “random spot checks” during the season and then refused to release the results of those checks, no doubt because doing so would confirm that there was nothing unusual about footballs falling below regulation in cold weather. Many of the flaws in the Wells and Exponent Reports have been exposed. The detailed scientific critiques of the Exponent Report have been explored by experts. But many of the dubious bases for the Wells Report remain unexplored. For these reasons, we post below our counsel Daniel L. Goldberg’s further review of the circumstances that led to the League’s investigation and the League’s bases for continuing its pursuit of Tom Brady and the discipline imposed on the Patriots. We hope that it will induce added examination by those who are interested and allow them to reach their own conclusions regarding this matter and how the PSI of the footballs at the AFC Championship Game in January 2015 came to be under 12.5 PSI. The day before the AFC Championship Game on Jan. 18, 2015, the general manager of the Indianapolis Colts sent an email to the League raising concerns about the air pressure of game balls used by the New England Patriots. He did not ask the League to take any steps before the game to keep control of the game balls the next day or do anything else to ensure that the game balls would meet regulation. Rather, he suggested that the game balls used by the Patriots be checked “as the game goes on.” In response, the League took no precautionary steps in advance of the game and did not notify the Patriots of the concerns. Nor did the League consider the potential impact of weather on PSI, because the League was completely unaware of such impact. When League personnel gauged footballs at halftime, it was the first time in the League’s 95 year history they had done so. They found that the PSI levels of the Patriots footballs used in the first half had fallen below the range prescribed by the Official Rules of the NFL. Unfortunately, the League drew conclusions about the reasons for those PSI levels without taking into account the effect of weather or the Ideal Gas Law, a scientific equation that explains that for every drop in temperature there will be a corresponding, and calculable, drop in PSI. The data collected that night showed expected drops in PSI. Unfortunately for all involved, the League leaked inaccurate PSI numbers to ESPN shortly after the AFC Championship Game. The leaked misinformation sparked a firestorm of speculation and a presumption of guilt that the Patriots and Tom Brady were forced to address. A recent ESPN public editor column addressed the League’s leak. The accurate data would not be revealed by the League until over 15 weeks later, on May 6, 2015, when the Wells Report was made public. In the 10 months since, the Wells Report and the accompanying report by Exponent, the scientific consultants hired by the League’s lawyers (despite Exponent’s history of questionable findings, including that second-hand smoke causes no health risks), have been widely criticized by journalists, professors, lawyers and countless others. For example, Malcolm Gladwell, the well-known author of “The Tipping Point,” has referred to the Wells Report as “astonishing garbage.” The scientific flaws of Exponent’s analysis have received extensive scrutiny by independent scientists, engineers and mathematicians, who have no link to any party but are interested in the science that formed the foundation of the Wells Report. Once these independent minds had a chance to review the true data — not the erroneous data leaked by the League at the outset — and match it up with science, the scientific explanation of the PSI of the footballs on Jan. 18 became undeniably clear and completely contradicted the findings in the flawed Wells and Exponent Reports. Rule 2 in the NFL’s Official Rule Book prescribes a range of 12.5 to 13.5 PSI for footballs used in games. This PSI range has been in place for decades. It did not derive from any competitive concerns over air pressure. There has never been a study of whether football air pressure has any impact on game play or whether minor differences in PSI are even discernible to the touch. Rule 2 was apparently based on a recommendation by the manufacturer of the footballs, much like a tire manufacturer provides consumers with a suggested PSI for its tires. In the history of the NFL, prior to January of 2015, the League never paid much attention to what happens to the PSI of footballs during a game, and the PSI of footballs was never measured during or after any game. Pursuant to Rule 2, footballs are gauged pre-game in the Officials’ Locker Room to check that they are in the permissible PSI range. Even if the footballs measure pre-game at the high end of the range at 13.5 PSI in a 72°F Officials’ Locker Room, due solely to temperature changes, they will be below regulation during the game if the temperature on the field is below 52°F. It is also a scientific fact that footballs that are gauged pre-game at the low end of the range, at 12.5 PSI, will be below regulation if the temperature on the field is even slightly below the temperature in the Officials’ Locker Room. Troy Vincent, the League’s top football operations official, who was present at halftime, testified in Tom Brady’s appeal hearing that he had “no idea” that footballs “were automatically going to lose pressure if it was cold outside compared to how warm it was inside.” He had no familiarity with the Ideal Gas Law. He was not alone. Apparently no game official or anyone at the League had any understanding about the impact of temperature changes on PSI. What was initially seen as scandalous (and, remarkably, continues to be characterized that way by the League) was that the Patriots’ footballs, which measured pre-game at 12.5 or 12.6 PSI, had fallen below regulation after being used in the first half. This circumstance is now generally understood to reflect a basic law of nature, since the 2014 AFC Championship Game was played at an outdoor temperature of 48°F and the footballs had measured at 12.5 or 12.6 PSI in the 72°F Officials’ Locker Room prior to the game. The reality is that every NFL game ever played in temperatures under 50°F likely involved use of under-inflated footballs if they were in the 12.5 to 13.5 PSI range when checked pre-game. The Patriots’ footballs were also wet, having been used in the rain, and it is a scientific fact that wet conditions also affect PSI. Given the total lack of understanding about how temperature and weather impact the PSI in footballs, accusations of cheating by the Patriots were already being made by League officials during the second half of the AFC Championship Game. Less than 24 hours later, this prejudgment of wrongdoing was officially adopted by the League. In this letter from League Official Dave Gardi to the Patriots the day after the game, Mr. Gardi advised the Patriots that the League had made a “preliminary finding” that there may have been tampering with the footballs and the League was launching an investigation of the team. The League still had no understanding of the Ideal Gas Law when it sent this letter. Despite League personnel having recorded the halftime PSI measurements, both Mr. Gardi’s letter to the Patriots and the information leaked by League sources contained significantly inaccurate PSI information, exaggerating the loss of PSI in the Patriots’ footballs. Both also inaccurately stated that, in contrast to the Patriots’ footballs, each of the Colts’ footballs had measured within the permissible PSI range. In actuality, three of the four Colts’ footballs, which started at or above 13.0 PSI, measured below regulation on the gauge that the Wells Report concluded was the proper gauge to consider. Had the actual PSI halftime measurements been released in the days following the game, there would have been a quick scientific assessment and explanation of the situation. Instead, the accurate information was inexplicably kept from the public (and the Patriots) by the League and the League’s lawyers for months. The false information was allowed to fester, creating largely inalterable and inaccurate public perceptions of what happened. As mentioned above, since the release of the Wells Report, numerous independent scientists have studied the data. Every scientist known to have examined this data since has concluded that the halftime PSI of the Patriots’ footballs was consistent with the Ideal Gas Law. (See, for example, http://sports.yahoo.com/news/1-year-after-deflate-gate-ballooned–science-shows-shame-of-it-all-073316233.html). There has also been widespread independent criticism of Exponent’s methodologies and conclusions. What has been largely overlooked is that even Exponent, the NFL’s paid consultant, found that the Patriots’ halftime PSI numbers were fully explainable by the Ideal Gas Law depending on when, during halftime, those footballs were measured. According to Exponent, if the 11 Patriots footballs were measured, on average, within the first two minutes of halftime, their PSI measurements were fully explained by the Ideal Gas Law. (See Exponent Report at pp. XIII, 54, and 67). Other scientists, taking into account that the Patriots’ footballs were wet, causing them to warm up more slowly, have put that time frame at over four minutes. Myth #1: The NFL’s lawyers told Exponent to assume it took up to 9 minutes of halftime to complete the initial gauging of 11 Patriots’ footballs. As the Wells Report concedes, “the analysis of the data is ultimately dependent on assumptions and information that is uncertain” (Wells Report at p. 12), and that “varying the applicable assumptions can have a material impact on the ultimate conclusions” (Wells Report at p. 13). Exponent’s conclusion that there was an available scientific explanation for the halftime PSI readings was undercut not by facts or science, but by assumptions given to Exponent by the NFL’s lawyers regarding the timing of events at halftime. According to the NFL’s lawyers, just the gauging of the 11 Patriots footballs took up to 9 minutes: 2 to 4 minutes to start to gauge them and an added 4 to 5 minutes to complete the gauging. No records were kept of the timing of the halftime PSI measurements. Seven League officials witnessed the halftime events, but no interviews recounted in the Wells Report state what any witness said about when the gauging of the Patriots’ footballs began, how long it took, or when it ended. No simulations were done to see how long it might have taken to start and complete the gauging. The information in the Wells Report from the interviews of seven League and Game Officials present at halftime was that: (i) the first thing the Officials did upon entering the Officials’ Locker Room was to gauge 11 Patriots’ footballs; (ii) the Colts’ footballs were gauged sometime thereafter; (iii) only four Colts’ footballs were measured because the Officials “were running out of time before the start of the second half” (Wells Report at p. 7); and (iv) halftime lasted 13.5 minutes. Information presented in the Wells Report reflects that the two minute average for measuring the Patriots’ footballs is very likely what happened. The officials hurried into the Officials’ Locker Room at halftime with a plan to gauge all of the Patriots’ and Colts’ footballs. They knew that time was limited and that they needed to act quickly. It takes two to three seconds to gauge a football, as confirmed by the highly-viewed video of a Game Official gauging a football before a 2013 Chicago Bears game, which video was part of a Peter King MMQB report. Further, it is a basic premise of the Wells Report (and of an Exponent study that appears as Appendix 2 to the Exponent Report) that one person, acting alone, can complete the following in less than 100 seconds: (i) enter a room; (ii) lock the door; (iii) take 12 footballs out of a bag; (iv) stick a needle in each of those footballs to remove air; (v) place them back into the bag; (vi) unlock and open the door; and (vii) leave the room. If all that can be completed by one person in roughly 1 minute and 40 seconds, it is reasonable to conclude Messrs. Blakeman and Prioleau could begin to gauge the Patriots’ footballs less than a minute into halftime and complete the gauging in two minutes — i.e., taking 5 seconds for each man to gauge each football. That timing would support Exponent’s conclusion that science can fully explain the PSI of the Patriots’ footballs. Under the timing assumptions of Myth #1, the Officials would not have finished their initial gauging of the 11 Patriots’ footballs until up to nine minutes into halftime. That would have left less than five minutes to re-inflate and re-gauge them and, as was their intent (see Wells Report footnote 35), to gauge all of the Colts’ footballs. Using a pump to re-inflate each of the 11 footballs, and then using a gauge to ensure each was within the range of Rule 2, would logically take as long or longer than the four to five minutes the NFL’s lawyers assumed it took just to gauge the 11 footballs in the first instance. If the NFL’s lawyers’ assumptions about timing were accurate, it would mean the Officials could not have completed all these actions, let alone gauging even four Colts’ footballs, during the 13.5 minutes of halftime. The League’s lawyers have refused to release the interview notes of the seven League witnesses to halftime gauging. They have also refused to release their communications with Exponent. There is no privilege or confidentiality around any of these communications — they were not attorney-client communications and they were not attorney “work product” (a term used to refer to materials prepared by lawyers in anticipation of litigation). These communications were made as part of what was supposed to be a transparent, independent fact-finding mission — not a mission to prepare for litigation. The NFL’s lawyers’ claim of a “work product” privilege for these interview notes is most curious. Unless there was a prejudgment that the investigation would find violations — the only circumstance that might lead to anticipated future litigation — there would be no reason at the time of the interviews to anticipate any litigation. In all events, the League has the right to waive any claims of privilege, and yet has held tight to this critical information. Myth #2: The Colts’ footballs were gauged immediately after the Patriots’ footballs were gauged, and before the Patriots’ footballs were re-inflated and re-gauged. The NFL’s lawyers told Exponent to assume that the Colts’ footballs were gauged before the Patriots’ footballs were re-inflated, yet the Wells Report does not describe what any of the seven League witnesses present at halftime actually said regarding the sequence of these events. The only relevant information recounted in the Wells Report is that: (i) only four Colts footballs were measured at halftime because the Officials were running out of time as halftime was ending; and (ii) Mr. Blakeman and Mr. Prioleau switched gauges at some point after they finished measuring the Patriots’ footballs and before they started measuring the Colts’ footballs. These facts strongly suggest that the Colts footballs were measured only after the Patriots’ footballs were re-inflated and re-gauged, and as the 13.5 minute halftime was ending. That would explain why, despite the officials’ plan to gauge all the footballs of both teams at halftime, they stopped after only getting to four of the Colts’ footballs. The most logical sequence of events would also mean the officials likely started to gauge the four Colts’ footballs at least 11 minutes into halftime, after they had warmed up and their PSI had naturally started to return to their original pregame air pressure. This additional time in the warm room fully explains why the Colts’ footballs appeared to lose less PSI than the Patriots’ footballs. However, despite admitted “uncertainty” about the sequence of these events, Exponent was told by the NFL’s lawyers to assume that the gauging of the Colts’ footballs followed immediately after the Patriots’ footballs were gauged and before the re-inflation and re-gauging of the Patriots’ footballs. (Exponent Report at p. 2). All of Exponent’s testing then relied on this instruction — every simulation done by Exponent was based on starting the gauging of the four Colts’ footballs less than 10 minutes into halftime. This assumed timing was so illogical that, as Exponent admitted, to account for it, Exponent had to manipulate the undisputed 72°F temperature of the Official’s Locker Room down to 67°F in some of its calculations. (See Exponent Report at p. 52). As numerous independent scientists have shown, using the more likely sequence of halftime events eliminates any mystery about why Colts’ footballs appeared to lose less PSI than the Patriots’ footballs. Myth #3: The Patriots’ footballs were not sufficiently wet to affect their PSI. This is another unfounded assumption the NFL’s lawyers told Exponent to make. The Patriots’ footballs measured at halftime were wet from being used in the rain for an extended period during the first half, and they had not been kept in plastic bags on the sidelines (as had the Colts’ footballs). Exponent correctly noted that the Patriots’ footballs were wet (Exponent Report at p. XIII) and that if footballs are wet, it slows the warming process and hence slows how quickly the PSI returns to its pre-game PSI levels. The wet condition of the footballs would impact the halftime PSI of the Patriots’ footballs and extend the two-minute average that Exponent concluded would provide a scientific explanation. )See Professor John Leonard’s transient analysis found here.) However, as stated in the Exponent Report (see p. 55), the NFL’s lawyers instructed Exponent to assume that the footballs were not sufficiently wet for these purposes. Myth #4: The two gauges used at halftime were the Logo and Non-Logo gauges brought to the Game by Referee Walt Anderson. The Wells Report assumes as fact that Anderson’s personal gauges were used at halftime, whereas the evidence suggests otherwise: (i) as recounted in a footnote buried in the Wells Report (footnote 37), neither Mr. Blakeman nor Mr. Prioleau recalled what gauge each used at halftime; (ii) Mr. Farley, the note-keeper at halftime, wrote down that one of the gauges used at halftime was the gauge brought to the Officials’ Locker Room pre-game by the Patriots (see Wells Report footnote 38); and (iii) the Exponent tests of the Logo and Non-Logo gauges showed they often varied from each other by as much as 0.75 PSI (Exponent Report at p. 29), while the two gauges used at halftime never varied by more than 0.45 PSI (Wells Report at p. 67). This strongly suggests that one of the two gauges used at halftime was actually the Patriots’ gauge — a gauge that was apparently used by League official James Daniel before halftime to measure the intercepted football (Wells Report footnote 36), but was never tested by Exponent. Myth #5: Referee Anderson used the Non-Logo gauge pre-game. Despite Mr. Anderson’s “best recollection” that he used the Logo gauge pre-game, the NFL’s lawyers rejected it. To determine PSI changes from pre-game to halftime, one would have to use the same gauge at halftime that was used by Referee Anderson pre-game, since gauges vary from each other in accuracy. The Logo gauge, at halftime, did not show as much PSI loss as did the Non-Logo gauge, so knowing which gauge was actually used before the game is critical. Referee Anderson expressed no uncertainty about which gauge he had used pre-game. This was not his first time gauging footballs pre-game — he was a very experienced Referee and likely had a longstanding routine as to which of his two gauges he used and which was the backup. He knew the gauges well. He had used one of the gauges for three or four years and had the other one for at least one year. He clearly knew the differences between them. His “best recollection” was that he used the Logo gauge before the game. One can imagine a line of questions asked by lawyers during his interview that could lead him to say it was “certainly possible” that his best memory might be wrong. But it is a fundamental flaw to rely on matters that are merely “certainly possible” as the foundation for concluding what is “more likely than not,” the required standard of proof of the investigation. Exponent then went to great lengths to try to bolster the lawyers’ rejection of Mr. Anderson’s best recollection of which gauge he used pre-game, but those efforts have been completely discredited by every subsequent scientific review. Myth #6: The PSI measurements pre-game and at halftime were scientifically reliable enough to base definitive conclusions on them. Referee Anderson measured 48 footballs pre-game in the Officials’ Locker Room with the footballs spread out around him on the floor. His mission was simply to make sure they were in the permissible range of Rule 2. He was not charged with recording the PSI of each football. The NFL had no protocols for recording any data during the pre-game gauging process, and despite the notice from the Colts, had not adopted any protocols for the AFC Championship game. He did not recall which team’s footballs he measured first. He did his best to recall, days or weeks later, the precise PSI numbers of what, at the time he gauged the footballs, were inconsequential specifics. The same NFL lawyers who rejected his recollection as to which gauge he used nonetheless chose to assume the accuracy of his recollections of precise pre-game PSI numbers of each of 48 footballs, down to a tenth of a pound of PSI. The halftime gauging and recording of PSI, the first time in the League’s history this was done, followed no prescribed protocols because there were none. The result was, at best, confused and imprecise. No records were kept of when any measurement was started, how long the gauging took, or the sequence of when the Colts’ footballs were measured. Mr. Blakeman and Mr. Prioleau, who did not recall which gauges they used, inadvertently switched the gauges that were being used between gauging the Patriots’ and the Colts’ footballs. They called out their gauge readings to Mr. Farley, who wrote them down but put some of the PSI figures in the wrong columns on the list he was keeping (Wells Report at footnote 41). There was so much apparent confusion, imprecision and lack of recollection that the Wells Report fails to address who re-inflated the Patriots footballs, who re-gauged them, whether each football was again gauged twice, what gauge (or gauges) was used to re-gauge them, when this was done, or even at what PSI the footballs were set after the re-inflation. Only four Colts’ footballs were gauged as halftime was running out. Three of the four Colts’ footballs measured were under regulation on one of the gauges, but no one thought — or had time to — re-inflate any of them. It is not difficult to picture the rush to accomplish what had never before been attempted at any halftime of any NFL game. The footballs were delayed getting back to the field for the second half. These halftime measurements were no more precise or reliable than the post-game PSI measurements, which Exponent concluded did not provide “a scientifically reasonable basis” on which to conduct an analysis even though the measurements were “recorded in conditions similar to those conducted at halftime.” (Wells Report footnote 44). Those post-game PSI measurements, discounted by the NFL’s lawyers, showed Colts’ footballs as still being below regulation on one of the gauges, suggesting the Colts played the entire game with below-regulation footballs. There was so much imprecision about the halftime events that no one seemed to notice there was an extra, unexplained Patriots’ football on Mr. Farley’s list. Rule 2 mandated that, prior to the game, Referee Anderson was to ensure that there were 12 footballs placed in the Patriots “primary bag” for use during the game. Of those 12 footballs, one was taken out of play and set aside as a souvenir in the first half after James Develin caught a touchdown pass. A second football — the one intercepted by the Colts — had been set aside and was not one of the 11 Patriots’ footballs measured at halftime. That left 10 Patriots footballs to be measured at halftime. However, Mr. Farley wrote down that 11 Patriots footballs were measured. Buried in a footnote of the Wells Report (p. 68) is the effort to explain this extra football. Utilizing the same “certainly possible” approach to witness interviewing, the Wells Report attributes to Mr. Anderson that it was “certainly possible” there were actually 13 footballs initially put in the primary bag, not the 12 he was responsible to ensure were there. The possibility of an extra football being put in the primary bag raises even further issues about the precision of the pre-game gauging, as well as about what Mr. Anderson actually said, which is in the unreleased interview notes. In all events, what is “certainly possible” is not “more likely than not,” which is the required standard of proof for the League to find a rule violation. Myth #7: The Jastremski/McNally texts are evidence of an ongoing, longstanding scheme to deflate footballs below regulation after the Referee’s pre-game inspection. Despite the absence of a single text ever referring to any a scheme to deflate footballs, the NFL’s lawyers concluded that the text messages evidenced such a scheme. The NFL’s lawyers had access to thousands of texts, starting well before the 2014 NFL season and continuing past the AFC Championship Game. Despite it being clear from the texts that neither Mr. Jastremski nor Mr. McNally thought their texts would ever be seen by others, not a single text directs or recounts a scheme to deflate footballs after the Referee’s pre-game inspection. Not a single text even suggests that Tom Brady would want footballs below regulation. The absence of any texts confirming a scheme to deflate footballs is compelling evidence that there was no such scheme. The NFL’s lawyers drew all of their inferences from ambiguous texts. Although noting that numerous texts were obviously just attempts at humor, the lawyers felt they could divine which were simply humorous, tongue-in-cheek comments and which were not. 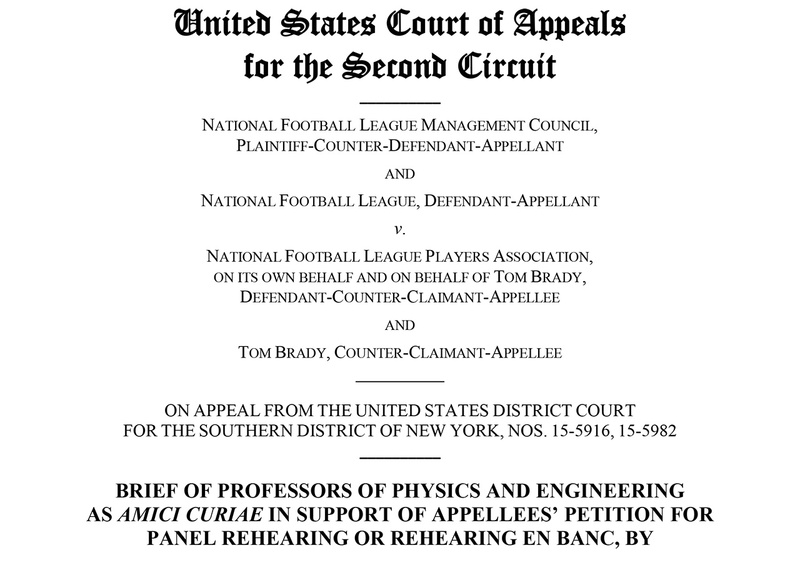 The NFL’s brief to the Federal Court of Appeals goes beyond interpreting texts and repeatedly mischaracterizes them. A prime example of manipulating the text evidence is the effort to create the myth that “deflator” was a frequently-used nickname for Mr. McNally. The Wells Report repeats the term numerous times (and the League’s appeal brief falsely asserts the term was used in texts throughout the 2014 season). It is an undisputed fact that, in the thousands of texts, the term was actually used only once, in a single text sent in the off-season (May 2014), some eight months before the AFC Championship Game. It appears in a string of texts that had nothing to do with footballs. The May 2014 text was so disconnected from footballs and the football season that, in over 20 hours of questioning of Mr. McNally and Mr. Jastremski, the NFL’s lawyers had overlooked it and never asked about it. Myth #8: The Jastremski/McNally texts did not contradict the existence of any deflation scheme. In fact, there are key texts which contradict the existence of a deflation scheme. Mr. Jastremski and Mr. McNally texted following the Jets game in October 2014, where the footballs used in the game had been significantly over-inflated. Had there been a conspiracy for Mr. McNally to deflate footballs after the Referee’s inspection, Mr. Jastremski’s texts to Mr. McNally would most likely have blamed Mr. McNally for not carrying out the scheme. He did just the opposite, blaming the referees for not re-checking the footballs after adding air to them: “The refs f’d up.” “They didn’t recheck them after they put air in them.” Mr. Jastremski also texted his fiancé about having gauged the footballs after the Jets game and finding they measured 16 PSI. Most tellingly, he texted: “They [are] supposed to be 13 lbs.” These texts are inconsistent with the hypothesized scheme to deflate footballs. But since they do not fit with the conclusions of the Wells Report, they were essentially ignored. Myth #9: McNally secretly left the Official’s Locker Room and sneaked into a nearby bathroom. Mr. McNally’s departure with the football bags from the Official’s Locker Room and his trip to the field with those bags was anything but secretive or surreptitious. The facts recounted in the Wells Report actually show his movements were open and obvious, in plain sight of countless League Officials. As the start of the AFC Championship Game approached, the Game Officials told Mr. McNally to take the two primary bags of footballs from the dressing room of the Official’s Locker Room, where the Game Officials were doing their last-minute game preparations, and into the separate sitting room. The sitting room was so crowded with League Officials that it was described in the Wells Report as being like “Grand Central Station.” Mr. McNally sat at one end of the sitting room with the two large bags of footballs at his feet, watching the NFC Championship Game on TV along with the League Officials. When the NFC overtime game ended abruptly, Mr. McNally hoisted the football bags on his shoulders, walked approximately 15 feet down the entire length of the sitting room, past the League Officials, and went out the door of the Official’s Locker Room into the hallway that leads to the field. He did this in plain sight of all those League Officials. No one stopped him or suggested he needed to be accompanied on his walk to the field. No one described his movements as furtive or hurried. Any League official who wanted to accompany him to the field had numerous opportunities to do so. The hallway, including the entrance to the bathroom, was also monitored by security personnel and a security camera, of which Mr. McNally was aware, given that he had worked in the Stadium on game days since it was built. There was no opportunity to “sneak” anywhere. Mr. McNally walked down the hallway past the security personnel and past Mr. Daniel, a League employee who was aware of the email sent by the Colts prior the game, who opted not to accompany him, but again certainly could have. The bathroom stop was inconsequential, and when asked, Mr. McNally fully explained it. Nonetheless, this supposedly surreptitious bathroom stop was part of the narrative used to manipulate public perception. The security tape showing Mr. McNally’s entrance to and departure from the bathroom was apparently leaked by someone at the League soon after the erroneous PSI information was leaked. It certainly appears that someone at the League wanted to influence public opinion and put pressure on the Patriots. Myth #10: Tom Brady, despite never having so-stated, and despite all the contrary evidence, wanted to use footballs that were below regulation. The investigation took months and involved dozens of witnesses. None could point to a single statement by Mr. Brady that he preferred under-regulation footballs – either in games or in practice. The Wells investigators could have sought out former teammates, including backup quarterbacks and receivers, obvious witnesses with whom to explore this issue. They could have probed whether Mr. Brady, at practice, wanted to use under-inflated footballs to prepare. They could have tested whether under-inflated footballs provide a competitive advantage. They could have tested if marginal differences in PSI are discernable to experienced quarterbacks. They did none of these things. There is not a single witness, text, or any other evidence which supports the premise that Tom Brady wanted footballs at less than 12.5 PSI. The fact that he wanted them at the low end of regulation range – a preference he stated for the first time on Oct. 16, 2014 after the Jets game when the footballs were vastly over-inflated — is clearly not evidence that he actually preferred them lower. Indeed, the footballs were set at a consistent PSI for his pre-game inspection and selection (12.6 after the Jets game; 12.7 or 12.8 before that game). Common sense would suggest consistency of footballs — whether used in practice, in home games, or in away games — is of obvious importance to a quarterback. If PSI of footballs were important to a quarterback, it is only logical that consistency of that PSI would also be important. But such consistency would only be compromised should someone haphazardly stick a needle in them to remove air, and be able to do so only at home games. The entire point of the 2006 rule change that Tom Brady and other quarterbacks championed was to achieve consistency of footballs used at home games and away games. For Mr. Brady, the key was consistency of tactile feel of the surface of the football. He likes the footballs to feel well-worn; other quarterbacks prefer different surfaces. Before that rule change, the home team prepared the footballs used by both teams, which led to inconsistency of the tactile feel of the footballs at home and away games. The 2006 rule change allowed each team to prepare the footballs they would use in every game, whether home or away. That promoted consistency. The deflation scheme hypothesized by the Wells Report could have happened only at home games, since it is the home team’s staff who takes the footballs from the team’s locker rooms to the Officials’ Locker Room and then to the field. So the purported deflation scheme would have been contrary to the purpose of the 2006 rule change. The Wells Report ignores this point. There is no evidence that marginal differences in PSI are even discernible to the touch, or that they matter to game play. One can search through every page of the Wells Report for evidence that anyone, including those experienced in handling footballs, can even tell the difference of one pound of PSI in the footballs. Even Rule 2 allows a one pound range. The Game Officials handle the footballs before and after every play and are the only ones who handle both teams’ footballs and can compare how they feel. If there were ascertainable differences in PSI, it is the Game Officials who would be in the position to notice them. They never have. Nor is there any evidence that differences in PSI provide any competitive advantage. The NFL’s lawyers did not commission any tests to see if there is a difference in feel or performance between, for example, 11.3 PSI footballs and 12.5 PSI footballs. They did not compare Tom Brady’s performances in home and away games. Peter King, in his MMQB column, has conducted that analysis and found there to be virtually no difference in Mr. Brady’s home and away performances. If the League wanted to assess whether there is a competitive advantage from lower PSI footballs, they could compare the performances in games played in cold weather (where the PSI will be lower) to performances in games played in warm climates. That has never been done. Myth #11: Tom Brady’s statement that he did not think that anyone would tamper with the PSI of the footballs without his knowledge somehow proves that there was tampering and that he knew of it. This statement does not make either the PSI tampering or Mr. Brady’s knowledge of it “more likely than not,” which is the League’s required standard of proof. It is totally consistent with his testimony that he knew nothing about any such scheme — and that he does not believe there was such a scheme. No court would allow a decision about his “guilt” to be premised on this statement. Nonetheless, when pressed by Judge Richard Berman for the evidence against Mr. Brady, this statement was a key part of the response from the NFL’s lawyers. Myth #12: Increased communications between Mr. Brady and Mr. Jastremski after the AFC Championship Game is proof that there was tampering and that Brady knew about it. This Myth is a pillar of the League’s case against Mr. Brady, but reliance on Mr. Brady’s increased texting and communications with Mr. Jastremski after the AFC Championship Game as evidence of guilt actually belies common sense. If one assumes there was the long-running scheme involving Messrs. Brady and Jastremski, then one would also have to assume that the absence of any texts between them while that scheme was being implemented was quite deliberate — part of a vigilantly followed code of silence. Of course, once the story broke, there would be even more reason to be sure there were no texts being exchanged between them, and particularly none that referred to the breaking story. In fact, of course, on the heels of the matter becoming public, they do just the opposite and start to text freely and frequently. Mr. Brady is obviously curious about the breaking story, which involves footballs that he knew Mr. Jastremski prepared for the AFC Championship game. It would have been far more curious if Brady was being asked about the issue by the media, as he was the morning after the game, and he had not then followed up with the person he knew prepared the footballs. And, independent of the breaking story, Mr. Brady knew that the Super Bowl the team had just qualified for would be an enormous task involving 100+ game balls and decisions about how the footballs would be prepared, when they would be sent to the Super Bowl venue, whether game balls would be available for practice, and a whole host of other immediate decisions as to which Mr. Jastremski had no experience, having not prepared game balls for previous Super Bowls in which the team participated. Mr. Brady was clear in his testimony before the Commissioner that both issues were discussed — the breaking story and the preparations for the Super Bowl, but the NFL’s lawyer, in arguing in the federal appeals court, repeated the Commissioner’s misstatement that Mr. Brady testified that he and Mr. Jastremski only discussed the Super Bowl (and therefore was not credible). None of the Brady-Jastremski texts even suggest that there had been a scheme of any kind to deflate footballs or to engage in a cover up of any such scheme. But when pressed by Judge Berman for the evidence against Brady, the increased texting was one of the only things to which the NFL’s lawyers could point. Myth #13: Autographing a handful of items upon request, or including Mr. Jastremski on a list of over a dozen team staff members for holiday gifts, is evidence of Tom Brady’s guilt. Mr. McNally, who supposedly carried out the deflation, never received anything from Mr. Brady except his autograph on three items Mr. McNally provided. Mr. Brady did not recall signing these items — not surprisingly, since he routinely is asked for, and provides, autographs, especially when the request is from someone in or around the team’s locker room. Like Many NFL players, Mr. Brady not only routinely signs autographs but also recognizes team staff members at the holidays. Mr. Jastremski, was one of over a dozen team staff members that Tom Brady included on his holiday gift list at Christmas. There is no basis to conclude, as the NFL’s lawyers have done, that there were any payments to induce or reward improper deflation of footballs. Myth #14: Tom Brady’s decision not to retain his phone reflects his guilt. Before the interview of Mr. Brady, his lawyers were specifically advised, in an email from the NFL’s lawyers, that Mr. Brady did not need to turn over his personal phone, and that a statement by his attorneys concerning messages on his phone was all that was needed. The February 28, 2014 email to Mr. Dubin, one of Mr. Brady’s lawyers, from Mr. Burns of the Paul Weiss firm (and with copies to his colleagues Messrs. Wells and Reisner, as well as to Mr. Pash, the General Counsel of the League) was very explicit: “We are not seeking to take possession of his phone or to image its contents.” Mr. Brady’s counsel confirmed to Mr. Wells that the phone would not be turned over due to privacy and precedential concerns. The only reason that the phone became a focus at all was because the League was being challenged by the NFLPA, in Mr. Brady’s appeal, on whether sanctions could be imposed on a player for supposed “general awareness” of a rule violation by others. That was the most that the Wells Report was able to conclude about Mr. Brady after months of investigation. The League’s lawyers realized that a sanction based on “general awareness” was legally vulnerable, and that no player had ever been sanctioned for being “generally aware” that someone else had allegedly violated a rule. It was therefore important, if sanctions were to be maintained, that there be some evidence in the appeal hearing that Mr. Brady’s involvement went beyond “general awareness.” No such evidence came to light during the all-day hearing before the Commissioner. All the evidence, including Mr. Brady’s sworn testimony, was to the contrary. There was simply no basis in the evidence that allowed the Commissioner to move from “general awareness” to finding actual involvement. Mr. Brady’s non-retention of his phone became the only available hook to do that. The League already had Mr. Jastremski’s and Mr. McNally’s uncensored texts, including all the texts between Mr. Jastremski and Mr. Brady (there were none between Mr. McNally and Mr. Brady). As part of his appeal, Mr. Brady actually provided the League with far more information about his texts than had been provided during the Wells investigation. The League could have gone to others with whom Mr. Brady texted (he provided a complete list) to ascertain the content of any other texts that they were curious about. Rather than investigate the list Mr. Brady provided, the League simply created the myth that the phone was “destroyed” because it must have contained evidence of wrongdoing. This myth was so important to the League’s spin on the story that it was the focus of the League’s press release when the Commissioner’s decision was issued. The League has escalated the importance of the phone even further, now equating Brady’s non-retention of a phone it never asked for to a player masking the use of banned substances. This inflammatory reliance on the phone’s non-retention reflects the League’s realization that there is simply no evidence that implicates Mr. Brady in any deflation scheme. Myth #15: There was no action by any League officials that reflected any predisposition against the Patriots or warranted any criticism. It is an old adage: Never bite the hand that feeds you. The lawyers selected by the League to do an independent investigation had a long and deep relationship with the League. There were serious issues about League conduct and prejudgments — issues that warranted thorough investigation. But the NFL’s lawyers never asked for a single text or email from any League or Game Official, and the Wells Report contains not a single criticism of any conduct by any League or Game Official. The list of acts and omissions which warranted serious investigation, if not critique, is remarkably long. It includes: (1) not advising the Patriots of the Colts’ concerns about PSI expressed the day before the game or taking other steps pre-game in order to help ensure there were no issues in the upcoming championship game ; (2) not keeping control of the footballs pre-game as the Referee is required to do by Rule 2; (3) despite the expressed pre-game concerns about PSI, not recording the pre-game PSI of game footballs (or the gauge used); (4) during the game, not bringing the Colts’ concerns about the intercepted football immediately to the attention of the Referee, who, under the rules, has sole responsibility to determine if footballs comply with the rules; (5) allowing the rest of the first half to be played with what were then presumed to be under-inflated footballs; (6) excluding the Referee from the halftime gauging and re-inflating despite these matters being the sole responsibility of the Referee under Rule 2; (7) despite Rule 2 having been in place for decades, having no understanding that PSI is affected by temperature changes and weather; (8) rushing to judgment, including accusing the Patriots of cheating in the second half of the AFC Championship Game and making a “preliminary finding” of tampering with the footballs the day after the game, despite the total lack of understanding of the Ideal Gas Law; (9) providing incorrect information to the Patriots about the PSI of both Patriots footballs and the Colts footballs in the formal League letter; (10) leaking incorrect PSI information to the press (ESPN has confirmed that the false information came from sources within the NFL); and (11) refusing to correct the false PSI information for months, despite seeing the media and public reactions, and the harm to the Patriots, caused by that false information. This situation would have been brought to a quick close if the League had even a general awareness of the scientific impact of temperature and weather conditions on the PSI of footballs at the time of the AFC Championship Game. Prompt correction of misinformation leaked by the League would have allowed knowledgeable and objective people to assess the numbers and minimize the media frenzy and public furor. For reasons still unknown, the League and its lawyers refused to release the accurate information for months, doing so only in the context of a report which based its conclusions primarily on dubious interpretations of ambiguous texts. The Wells Report is written more as a piece of advocacy trying to support its predetermined conclusions than as an independent and dispassionate review of all the facts. The League’s lawyers have refused to produce their interview notes, their communications with Exponent, or the extent of the edits by the League’s General Counsel to drafts of the Wells Report. The League has also refused to provide the PSI data it collected during the 2015 “random spot checks.” If properly performed, those checks undoubtedly confirm that numerous games are played with below-regulation footballs due to the impact of weather conditions on footballs. The integrity of the League is of vital importance. One can only wonder if it has been seriously compromised by the League’s lack of transparency and what appears to be an ongoing effort to defend, rather than critically assess, the dubious conclusions and methodology of the Wells and Exponent Reports.